Today's card is another super fast and easy card I made for the Scrapping Cottage using the darling CottageCutz Balloon Bouquet! This is one of the many DARLING CottageCutz Dies from the "Birthday" Release! Card Measures 2 1/2" x 6"
Super fast and easy to make! I cut the card stock at 5" x 6 then scored on the 5" side at the 2 1/2" mark. I rounded the corners once scored and folded using a 1/2" corner rounder. Next I cut the card stock at 2 1/4" x 5 3/4" and rounded the one side. I did distress the card stock using distress ink and a duster. 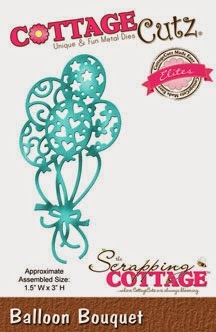 Next I cut the CottageCutz Balloon Bouquet with blue card stock, and then added glitter glue to the balloons. set aside to dry, unless you do embossing powder and heat dry, that would be faster. I then added my ribbon and bow, and lastly the pearl half backs to the bottom. Just darling. The balloons are so cute.